Alexander the Great versus Genghis Khan: Whose army would win? Could Alexander the Great’s Army Defeat Genghis Khan’s in Battle? 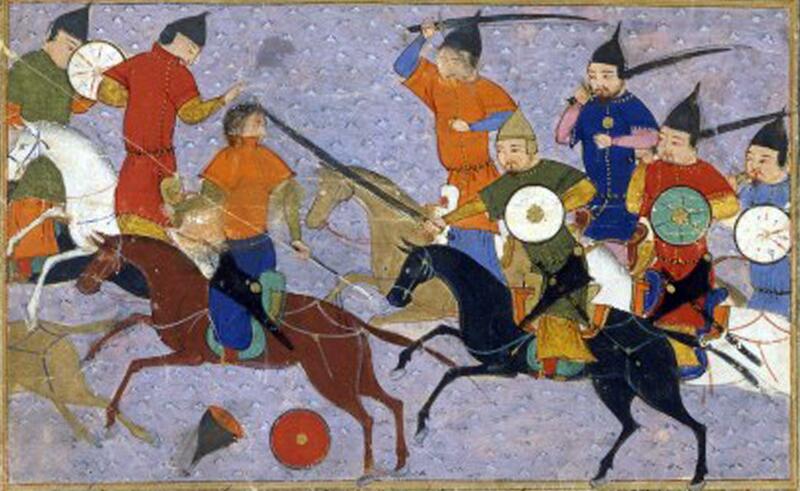 Battle between Mongol and Chinese armies, 1211, from Jami’ al-tawarikh by Rashid al-Din. Iron becomes steel when exposed to just the right amount of carbon, hardening it enough to keep an edge while maintaining enough flexibility to not be brittle. In Alexander the Great’s time, steel was either unheard of or incredibly rare. (It’s disputed.) In Genghis Khan’s time, it was mass-produced by the ton to arm and armor entire armies. Alexander’s forces mostly wore pressed-linen armor. Parts of it were bronze and iron, but the majority was pressed linen, and it was good enough against the iron weapons of the time. Genghis Khan’s forces wore layered silk, lacquered leather, and steel. They had steel swords, steel spears, and steel-tipped arrows. Both of these incredibly important inventions for horseback riding are often taken for granted, but since the first man sat on a horse without falling off, it took many centuries (400 B.C.) for the next man to figure out that putting a chair on a horse was indeed a good idea, and then a few centuries more (300 A.D.) to figure out that sticking his feet through loops attached to the horse-chair is even better. Riding a horse without a solid saddle means all of your weight is on the animals’ back. With a solid saddle, the weight of the rider is distributed over a larger area to the horse’s flanks. This makes for a more comfortable experience for the horse, increasing its endurance. For the rider, a saddle provides a more comfortable seat, greater elevation, a groove, and raised backing for support. You can wear heavier armor without fear of falling off your horse. You can ride a lot faster (look at how horse jockeys shift their weight forward when moving at full speed) without fear of falling off your horse. You can slam your spear at full speed into some poor guy, driving the weight of your steed into them, without fear of falling off your horse. You can shoot a bow with greater power and accuracy, even standing all the way up on the stirrup to get extra height and have the gait of the horse stabilized by your legs, and not fall off your horse. Genghis Khan was intimately familiar with Chinese weapons, considering most of his life was spent fighting them. At this point in time, Chinese soldiers made use of flame throwers, shrapnel bombs, and breech-loading guns. At the height of Genghis Khan’s reign, he had vanquished the northern Chinese Jin dynasty and absorbed their heavy cavalry and gunpowder armed infantry into his forces. Stirrup-equipped East Asian cavalry of this era ranged from light-horse archers to heavily armored riders on heavily armored horses. If Alexander’s cavalry chased after the light cavalry, they would be outmaneuvered while arrows are shot at them. If Alexander’s cavalry goes after the heavy cavalry, they will have to weather arrows at range to close in with their iron weapons against steel armor, or they get countercharged by men moving much faster, able to deliver greater impact on the charge (due to the saddle), and attack with greater mobility in melee (due to the stirrup). Then there’s leadership factors, such as Genghis Khan’s Mongols being more highly organized than Alexander’s Macedonians and able to coordinate complex maneuvers independently without Genghis Khan’s direct presence (while the Macedonians need Alexander to be there in person). And on top of all of this, you’re having Alexander’s mostly infantry and some cavalry army face off against history’s most famous cavalry force on an open field. Genghis Khan wins this very lopsided battle. If you’d like to know how city-dwelling people are suppose to beat the near-mythically unstoppable horse nomad (or wondered how the Chinese lived next to the steppes for 2,000 years without being conquered all the time), check out: Andy Lee Chaisiri’s answer to What would be a feasible contemporary defensive technique/tactic/strategy to deploy against an invading Mongol army? How would we tackle an alien invasion? Who would win in a fight: Galadriel or Sauron?